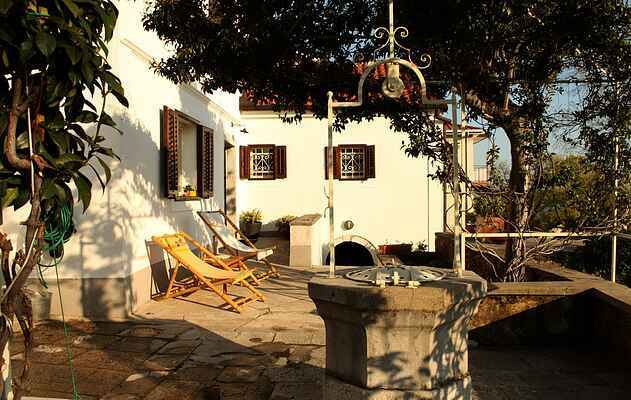 Vesna house is located in a very peaceful area of Kostrena, just 10 mins drive from Rijeka town center. This quaint and atmospheric house has been lovingly restored in 2006 and tastefully furnished by its owners. The large kitchen is properly equipped for discerning cooks and the 2 bathrooms allow ample comfort. Below the ground floor there is a cozy cellar with fire place. This is an deal location for BBQ or sitting in cool air in summer.The location of the house is interesting because it’s in the right spot for various activities. The beaches are 2km downhill with a few km long walk path along the sea shore. In 30min drive you can be in the mountains on 1200m high which is perfect for have a rest from the summer heat. In 30 min you can also be on the Island of Krk with it’s many villages and resorts. 30min drive is also Opatija and the Istria Peninsula with it’s many villages, taverns and wineries.